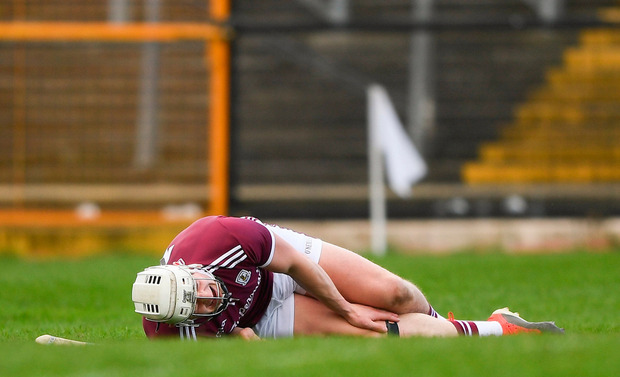 Joe Canning looks set for a quick recovery despite being forced out of Sunday's Allianz Hurling League semi-final with Waterford on a stretcher. Canning was shouldered hard by Waterford's Kevin Moran as he launched a desperate bid to salvage something from the game late on and the sight of his removal from the play in such a manner unnerved Galway and hurling supporters in general ahead of their championship opener against Carlow on May 12. Galway manager Micheál Donoghue had initially suggested he had suffered a groin injury but it was a knock to the upper leg from which he is expected to recover. Canning's club Portumna are in championship action in less than two weeks' time. Donoghue said after the game he'd be "intrigued" to watch back over some of the "heavy hits" which he felt his in-form forward was on the receiving end.